Usually they are living at the corners, but one day, the low confidence Penguin decided to go out to find his true self. It's always refreshing to see San-X add little touches to the characters to make them look even more kawaii. 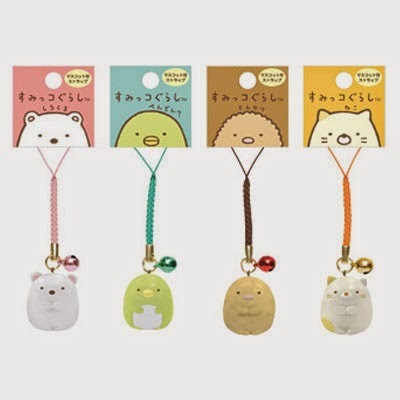 The whole idea of Sumikko Gurashi already captures many hearts as many people are able to see themselves in these creatures but with the additional touches, it actually increase the level of cuteness! Since this is an outing, Nisetsumuri, the slug is carrying not his snail shell but his luggage; Penguin and Zassou seemed to be dressed to fit the theme very well. These are some of the classic looking charms that was released under the outing catalog. The mobile stand was one of the more creative design as it is not only a stand but Zassou can be "plucked" out from the ground and use as a screen cleaner for your phone. The tree house looking plush is however, just a decorative plush that looks very cute when placed at a corner. In this series, San-X introduced a couple of new characters. Suzume, Tokage and Ebi Furai no Shippo! Out of the three, we are most in love with Shippo chan! She is always paired with Tonkatsu, most probably because they are the "leftovers" on a plate. She looks fluffy and dainty with that "ribbon" (tail) on her head. 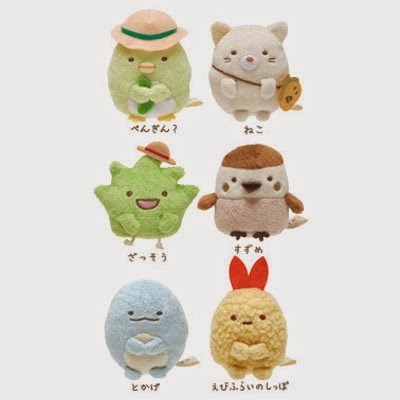 These six plushies are mini plushies that are about 60mm tall each and they can totally fit in any small corners on your desk top!